Edit September 18 2016 - We've posted an update for the current Subway Sub of the Day promotion here. 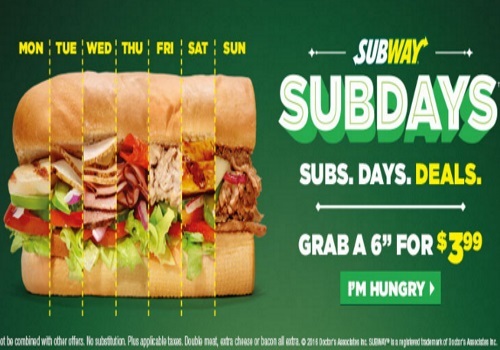 Subway SubDays are back! Every day of the week there will be a new sub for $3.99 a 6-inch or $7 for a footlong! Click here to find a Subway near you. What kind of company posts a website that tells you sub of the day and you go to store and no sub of the day offered? Mr sub just got a new customer. This post is from 2015, this offer has a been over for some time now. My local Subway has a 2 for $14 deal right now, but it's only at select locations. Please note, this blog is a personal site where I post deals that I find myself, nothing to do with Subway and we are not affiliated with Subway, you need to check their website for their current promotions. I literally JUST went to Subway and got this deal. I live in Thunder Bay. Subway handles their deals unbelievably bad.. I rarely go there anymore. where I live (Ottawa) there is a sub of the day deal on right now. try and find it, anywhere... even on Subways website they either don't post information, or they post the WRONG information (wrong subs on wrong days). you literally have to go to the store, because the website is 0/10 for informative.